New iMac? Migrate Your Data EASILY. Technology is designed to make our lives simpler. That's what it is for. However, we've come to expect that certain tasks get MORE complicated as technology advances. Especially when it comes to computing, we have come to expect that more tech = more complications. I'm happy to report that migrating data from one Mac to another is not one of those complicated tasks. We recently upgraded from our 2009 21" iMac, to a brand-new 27" 5K iMac. But before we can take the old iMac out of service, we need to ensure that we migrate every piece of critical data. In the past, that was an arduous process. I would usually remove the hard drive from the old PC, attach it to the new PC via USB or in an empty drive bay, and move files and folders one by one. In a typical Mac setup, that means moving your Photos Library, iTunes Librar(ies), and any loose documents and data. However... if you use iCloud like we do, your entire "migration" process may largely be complete! IF you have backed up our iTunes and Photos libraries to iCloud, you'll be able to access your music and Photos from the moment you set up your new Mac. Ensure that every photo in our possession has made it into the iCloud Photo Library. Store a local copy of the Photos Library to our iMac. BUT - before we move on - a brief reflection on our 2009 iMac. It was, without question, the greatest computer i have ever owned. From 1994 until 2009, I traded in my desktop PC every 3-4 years, minimum. And I usually spent the last year with a laggy PC that I couldn't stand. This iMac has been running for almost a decade, and is still going strong. It ran SEVEN versions of macOS -- Snow Leopard, Lion, Mountain Lion, Mavericks, Yosemite, El Capitan and Sierra -- with no issues. It even LOOKS new. 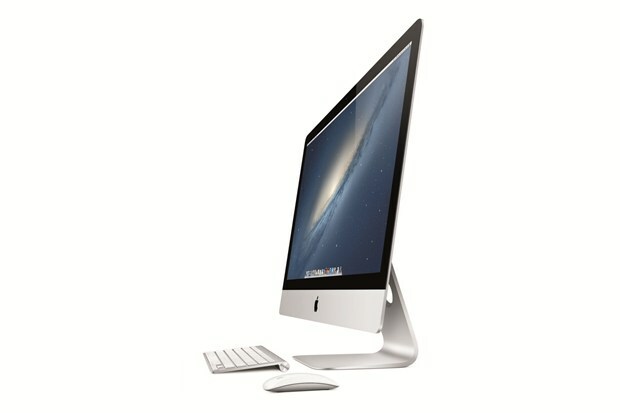 From the front, the 2009 iMac has the same form-factor as the current gen.
Unibody aluminum, with a mirror-black screen. This was the first iMac to have the "straight-edge" bottom border on the monitor. Magic Keyboard, Magic Mouse. So - thanks for your service, 2009 iMac. Enjoy your retirement years as an email-and-browser-only Mac at my dad's office. We were able to expand the RAM in our old iMac, but we had no easy way to get a larger internal hard drive. The new iMac has a 1 TB SSD, but we've learned our lesson. iTunes and iMovies libraries will NOT be stored on the iMac itself - that's what our QNAP NAS is for! Photos is a different case. Apple does NOT recommend using a NAS to store your Photos library - and doesn't allow iCloud backup from that library. Migrating Photos and iTunes - Easy! Assuming you've backed up your Photos library to iCloud, it's extremely easy to "migrate" to a new iMac... just log into iCloud, open Photos, and you'll see every photo in the library. For iTunes, we created a folder on the NAS called "iTunes", and then copied the entire iTunes Media folder to that location. Then, we mounted the NAS iTunes folder on the new iMac, and pointed iTunes at the new library. Migrating iMovie Videos - and Loose Files - More Difficult! Loose files weren't really "difficult".... unless you're like us, and kept files all over the place, and didn't use iCloud drive at all. Use Finder--All My Files, and then Finder--Home to poke around your old computer, and identify where you might have stored data. And then, the easiest way to migrate it.... get a 2 TB iCloud account and start uploading. If you're logged into iCloud on both iMacs, the files will be visible and downloadable from either. As for video files.... this ultimately required some decision-making. Eight years ago, I used this iMac to create a 30-minute home movie "show" for my parents' 60th birthday. I think I can do better today. Ultimately, I decided that a clean break with iMovie was our best bet. I kept a .MOV export of each of my finished iMovie projects, and copies of the underlying videos, which will be transferred to the NAS. I didn't bother exporting and recreating the iMovie Projects themselves.... we'll be starting clean. A WHOLE lot of our old home movies are digital transfers from VHS. Some of those are transfers from Super 8 to VHS, which 1) used to be a thing, and 2) reduced the picture resolution from "infinite" to "480i". I have the original Super 8 film reels, which represent all of my family's home movies from 1976-ish until 1987 or so. I've also got a box of old VHS tapes, which are our camcorder output from 1987 through the late 90s. I'll get the Super 8 stuff re-digitized, at HD or Blu-Ray resolution. The VHS stuff is what it is, but I recently picked up a JVC 9800-U SVHS player, so I can be assured of getting the absolute best possible output from those tapes. From about 2002 onward, I was working with a Sony Digital Handycam, and then with a Flip camera 1080p, and finally, with iPhones. Much of that recent video is stored in the Photos library. The older stuff goes to the NAS - and will be replaced with the new, better resolution captures. As for the old iMac - that's going to be reformatted this afternoon - and then it's off to my dad's office, where it will probably put in another 10-year run.